Well it looks like Denial of Service is not over in the City of Albany, as this Hearst Times Union April 5, 2012 story illustrates. This woman from West Hill, which I consider Uptown, found out the hard way. We even got the same old excuses - a burglar fleeing out your window is not an emergency! And apparently the dispatcher who took the call did not have the skills necessary to determine whether or not this was an emergency. What's different is that we are now hearing about this sort of thing. Houghtaling plans to leave the city. As soon as possible, she's relocating to Colonie. She lived there before. One night, she heard a banging at the back of her home. Was it a burglar? She called the police. "They were at my house before I even got off the phone," she said. And that, my friends, is the reason why people prefer to move to the suburbs. Not because the suburbs are a better place to reside, they're not. But people feel safer out there because the police respond to calls. That's a matter of choice by the people who make public policy. 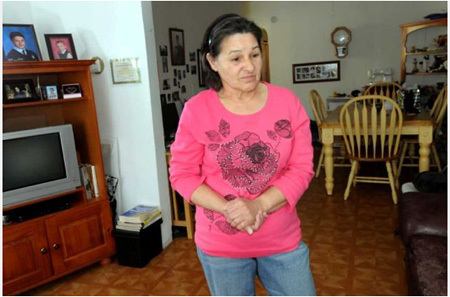 ALBANY — Donna Houghtaling arrived home as a burglar escaped through her kitchen window. She called 911. Then she waited. And waited. And waited some more. Finally, eight hours later, the phone rang as Houghtaling was watching the late news. It was Albany police. "They wanted to know if I was going to be up for awhile," Houghtaling says. "I said, 'How long is awhile?" An officer arrived before 11:30 p.m. He took a few notes, took a cursory look around. If he didn't seem optimistic about solving the crime, that was understandable. The case was cold. The robber was long gone. Houghtaling, a 64-year-old widow with custody of two grandchildren, lives in a small white house in the city's rundown West End, behind the new ShopRite supermarket on Central Avenue. She has a question: Why in the world did it take police so long to get to her house? Steven Smith, spokesman for Albany police, said the department is investigating the especially slow response to Houghtaling's call. He notes, though, that it was dispatched as a non-emergency and a low priority because the burglar was no longer in the house. "It went in as a 'get-a-report' call rather than a 'burglary-in-progress' call," Smith said. But who could say for sure there wasn't a second burglar hiding in a back bedroom? And what about actually catching the bad guy? Well, burglaries are routine in some parts of Albany. And Smith, who has listened to the 911 call, said the dispatcher believed the burglary had happened earlier in the day, not as Houghtaling arrived home. Therefore, it wasn't an emergency. But it was certainly an emergency to Houghtaling, who remembers being breathless and terrified. The retired housekeeper hadn't been away from home for long. She'd only gone to Colonie Center that Thursday to buy a toaster oven. She arrived home at about 3 p.m. with a big bag in her hands. The first sign of trouble? Something was wrong with the lock on the front door. She struggled to get it undone. When she finally did, she entered the house to crashing noises in the kitchen, where she found a wide open window and dishes on the floor. Houghtaling took a quick look outside, then made the 911 call. The burglar (or burglars) seem to have abandoned the thievery mid-stream. Cords behind a PlayStation and flat-screen TV had been yanked free, but the intruder left both behind. As far as Houghtaling can tell, nothing is missing from the house. The situation could have been much worse; one of her grandchildren was on his way home from school. "What if my eight-year-old grandson had walked through that door?" she asked. "What would have happened?" Of course, even for a non-emergency call, an eight-hour wait is waaaaaay too long. City residents deserve better than that. Smith, the spokesman, stressed an officer was headed to Houghtaling's home at about 4:30 p.m. But he got called away by a gun emergency elsewhere in the city, and never made it to her house. And why did it take another six hours before her call was answered? The department is investigating that, Smith said. Houghtaling belongs to a family that faced insurance fraud allegations in 2007. Her son, Joseph, was found guilty of a falsifying business records, but Donna Houghtaling was acquitted of all charges. She contacted the Times Union about the slow police response because she believes her experience provides a window into life in Albany. To her, the apparent indifference to a burglary sends a clear message: The city doesn't care about lower-income people. "If you're no one, you're going to get nowhere," she said. "That's just the way it is." Houghtaling plans to leave the city. As soon as possible, she's relocating to Colonie. She lived there before. One night, she heard a banging at the back of her home. Was it a burglar? "They were at my house before I even got off the phone," she said.